As the partial government shutdown rolls on, TSA paychecks aren’t coming in, and more agents are calling in “sick” as a result. San Francisco International Airport... is able to operate as normal because it is one of 22 airports in the U.S. that use private airport security, not TSA agents. The way forward for aviation security is through privatization. The flu season isn’t the only thing keeping some TSA agents out of work. As the partial government shutdown rolls on, TSA paychecks aren’t coming in, and more agents are calling in “sick” as a result. On Monday, the Transportation Security Agency reported a nationwide absence rate of 6.8 percent. That’s far higher than the absence rate of 2.5 percent which was reported on the same day one year ago. The core issue with the TSA model is the present conflict of interest created by self-regulation. Currently, TSA is operating as both the security regulator and security provider. The TSA model is quite uncommon worldwide. The more common models utilize the government as security regulator while a contractor or the airport itself provides security. This automatically push accountability and competition higher than the current U.S. model. In recent years, TSA has struggled to carry out its duties. That was made painfully clear by the results of the “red team” auditing test, where 67 of 70 weapons passed through TSA screeners. If the “red team” test had been performed on a private contractor and yielded similar results, they would likely have been immediately fired and replaced by one of their competitors. But the TSA is not so easily replaced. By looking to examples in Canada and Europe, we can observe how governments spend drastically less, yet still manage to meet international aviation standards. These countries show that privately-hired scanning teams can manage personnel far more efficiently than the government and still make a profit. They also cost significantly less—Canada spent about 40 percent less per capita on aviation security than the U.S. in 2014, for example. 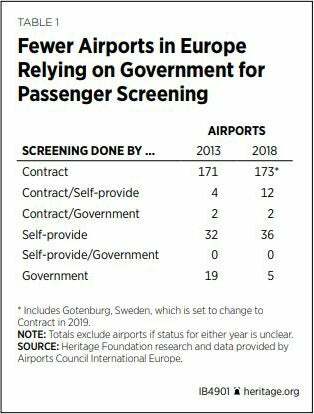 Shifting the responsibility for frontline aviation screening into the private sector would also improve security by letting the TSA focus purely on oversight and regulation.